Opening Friday 30 March 18.00 hrs. Body navigable roadmovie about Germans who, months after the World Cup football in 2006, are still hanging the national flag out. An exhibition concerning the concept of ‘homeland’, the need for pride and the fear of symbols. 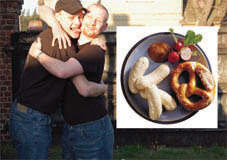 We serve Weißwurst and Bavarian Beer accompanied by a German Mix.